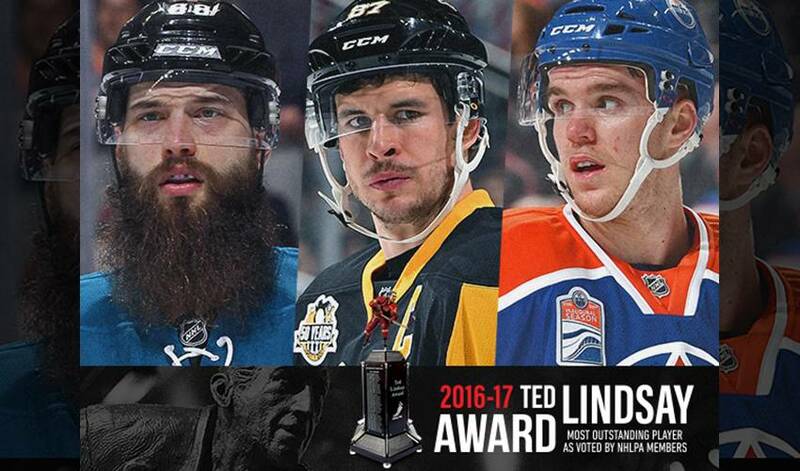 TORONTO (May 2, 2017) – The National Hockey League Players’ Association (NHLPA) announced today the three finalists for the 2016-17 Ted Lindsay Award: defenceman Brent Burns of the San Jose Sharks, centre Sidney Crosby of the Pittsburgh Penguins and centre Connor McDavid of the Edmonton Oilers. The Ted Lindsay Award is presented annually “to the most outstanding player in the NHL,” as voted by fellow members of the NHLPA. Crosby is vying for his fourth Award, while Burns and McDavid are each seeking to become the third consecutive first-time recipients of the Ted Lindsay Award (Carey Price, 2014-15; Patrick Kane, 2015-16).